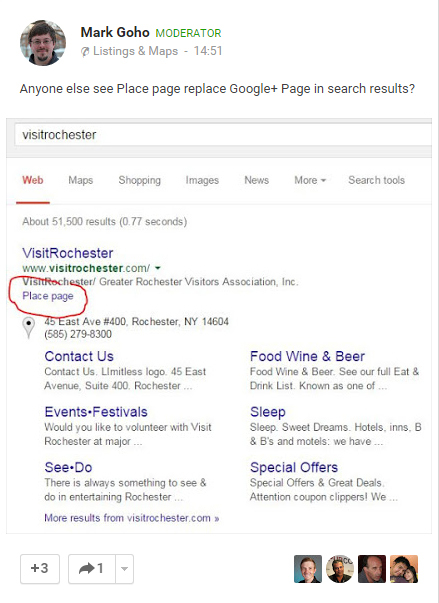 Google has changed the SERP snippet for closed Google Business Pages to Place Page. Previously all pages both closed and open had the same SERP snippet of Google+ Page. I can only assume this is to try and differentiate between a closed and open Google Business Page. Update: The “place Page” seems to be added to permanently closed businesses that have NO reviews. Checking a few closed businesses, seems to indicate that Closed Business Pages have this change. Other users commented that they could not replicate, leading to a the possibility of this being a test rather then full roll out. Last month Google My Business also announced that verified business pages that get ignored for over 6 months may have their verified status removed, could these pages also see a differentiation in the future? Have you noticed any changes to closed business pages ? Changes coming to Google Local … is your business ready?